My late night workout last night was really intense. I think we were having a "I need to talk and not so much workout" night last night so we got on elliptical machines beside each other and rode. We could hardly speak to each other from all the panting and heart rate checking that was going on. It ended up being a great workout with out heart rate in or ABOVE training zone the entire time. That was the good part. Last night when I got home from working out I was getting ready for bed, you know, shower, wash face, konk out in the bed! Well, while I was washing my face I somehow cut my cheek. I had a little blemish there and all of a sudden, open wound, blood everywhere, crazy teeny tiny cut that was bleeding like crazy. 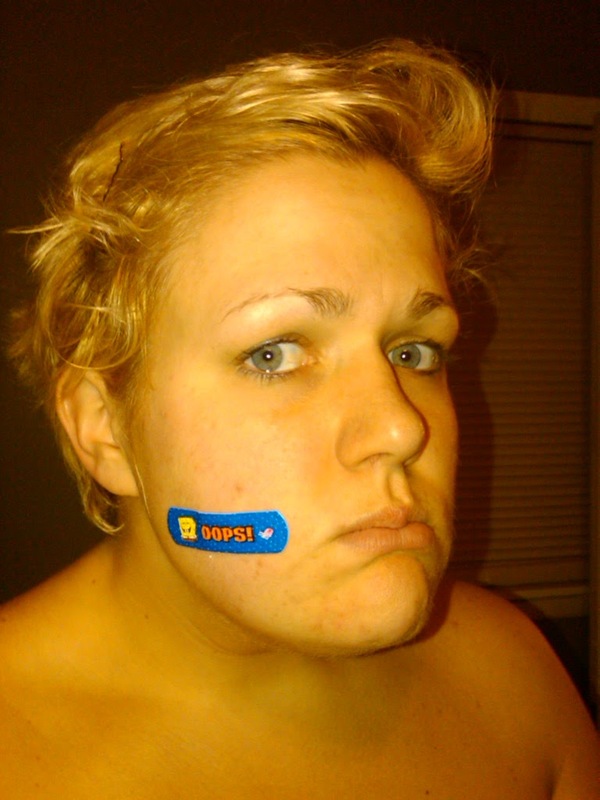 I finally had to put a band aid on it so I could finish getting ready for bed. I couldn't brush my teeth without blood running down my chin. Crazy....so I took a picture of it! You cant see it can you? Next, I ordered some bathing suits about 2 weeks ago and finally got them in. One of them fit fine, the other was so tight and so non-conservative that I could hardly look at myself wearing it in the mirror. We are talking fat squishing out everywhere, EVERYWHERE! I could have worn a string bikini that covered more than this bathing suit. Well, today I started the process of returning it and getting a different suit. It ended up taking me 3 phone calls to customer service and one online order just to get the stupid suit ordered. It might have been a sign that I didn't need the suit but I had already invested so much time ordering it that, dog gone it, I was going to get it done. Then today was the first time I was going to get to go to Zumba since surgery. My doc said that I could do it as long as I didn't jump. I have been so looking forward to this day...and I could not do it. It hurt from the first step so I waited for another song thinking it was a particular dance move, but I couldn't do the second song either so I just bowed out of class and went to ride the elliptical. This one really did hurt my feelers. I wanted to do this class so bad. On the brighter side, I got an amazing workout today. 45 minutes on the elliptical machine at level 10! I was sweating and panting by the end of it. Once I was done I was not upset anymore about Zumba, but I sure am ready to be able to do it again. BTW, I have Zumba pictures from the party coming soon. Tonight, I get to swim with my swimming buddy. We have been on hiatus for a few weeks so I am ready to get back to it, then laps for me. And finally, Biggest Loser tonight. The day is already looking up. Update: My protein shake today tasted like chocolate dirt...I just wanted to get it all out so I can focus on better things today!